Welcome to the St. Louis Small Business Monthly (SBM) Media Center! Whether it's in print each month, online, or in-person at one of our many events, SBM provides access to owners, partners, CEOs and other key decision-makers within St. Louis companies. When you want to impact top executives, turn to SBM. Our monthly magazine, SBM, is a "must read" for CEOs, CFOs, presidents, owners and other top executives throughout the St. Louis region. They rely upon SBM to provide business ideas, strategies and insights to help them grow their companies. SBM provides these businesses with analysis and strategic insights to help them grow their companies. SBM was recently ranked No. 5 out of all business publications in the U.S. for having the most loyal readership, according to the Media Audit, a media rating company. See What We're All About. To View A Copy Of A Past Edition,Click Here. Receive The Small Business Monthly By Mail For Only $21.50 Per Year, Click Here. The Guide, published each October, is the ONLY RESOURCE Directory published for growing businesses. It includes: Over 300 of the "Best Businesses in St. Louis" in 13 categories; Resource information on over 150 organizations and agencies that help businesses grow; details on finding capital; and a complete legal guide for businesses. For More Information And Pricing For The Business Owners' Guide, click here. The largest business-to-business conference and trade show in Missouri, where 2,000-3,000 professionals come to learn, network and grow their businesses. The day includes an opening workshop, a full day's worth of seminars and workshops, an awards luncheon, more than 100 exhibitors and a networking happy hour. Two shows are held, one in the Spring and one in the Fall. Click here for more information on sponsoring and exhibiting at the St. Louis Business Expo. Event sponsorships are a great way for businesses to get face-to-face with the top area decision makers. One of the main benefits of sponsorship is 3-5 minutes in front of these decision makers. SBM event sponsorships include: Top Women Business Owners, Top 100 St. Louisans To Know, Top Young Entrepreneurs, Small Business Awards, Best In Business Awards, Family Owned Business Awards and Top Young VIPs. SBM also hosts monthly speaker breakfasts and other custom networking events. SBMon.com has a wide array of tools and resources for St. Louis business leaders, including an upcoming events calendar and past "Best practice" articles. SBMon.com also contains a business directory of hundreds of local and national business resources. The site also contains information on our signature "Best in Business" award winners and information on our upcoming events and awards. Click here for more information on advertising with SBMon.com. March Top Women Business Owners. In the March edition, we will honor the area's top women business owners. Click here for more information on the section and to see ad rates. Click here for information on the Top Women Business Owner Luncheon. April Top Companies To Know. In the April edition, SBM is focusing on the "Top 100 St. Louisans You Need To Know To Succeed In Business." These individuals will all be featured in this special issue. 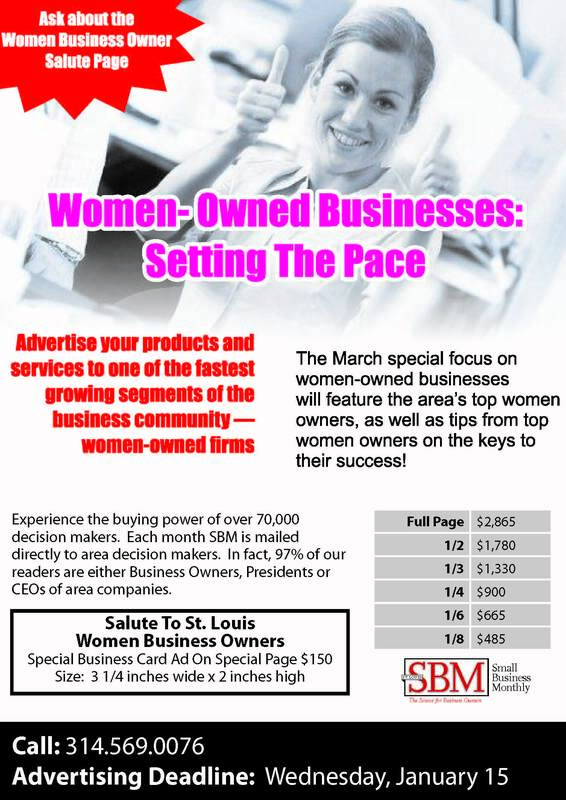 As well as these key leaders, the edition will also contain a special ad section, "Top St. Louis Companies to Know." This is your chance to let readers, eager to discover those that can change their businesses, know more about how you can help. Special Pricing Is Available: Double Your Ad Size On All Ads in the Section. Click here for more information on the section and to see ad rates. Click here to see samples of the "Top Companies To Know" ads. Your chance to Shout Your Story. Tell your story in the December edition of SBM. Purchase an ad in the edition and get the same amount of space for free to tell your story. The article will not only appear in the December SBM but will be searchable online. Plus, SBM will provide a .pdf version of the reprint for future marketing efforts. Highlight your top lenders and let others know how they can help businesses fund their companies. Click here to see a sample from 2013.